Having worked this pattern before... I knew exactly what I was getting into as far as the actual knitting part goes. 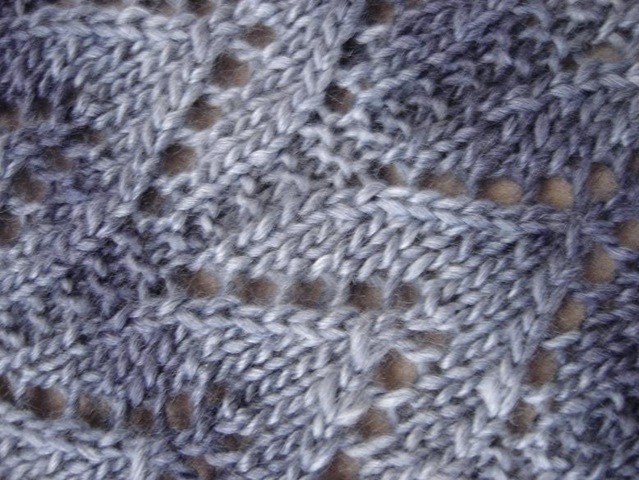 I had not had the occasion to knit with Patons SWS (Soy Wool Stripes) before though... so that was a pretty new experience. Just knowing the high Feltability (is that a word?) of the yarn, I will have to be sure and educate the eventual owner of this shawl that it should be washed with cold water only and with very little (no) agitation... or this shawl may become a felted mess! The reason I chose this yarn is a little convoluted. 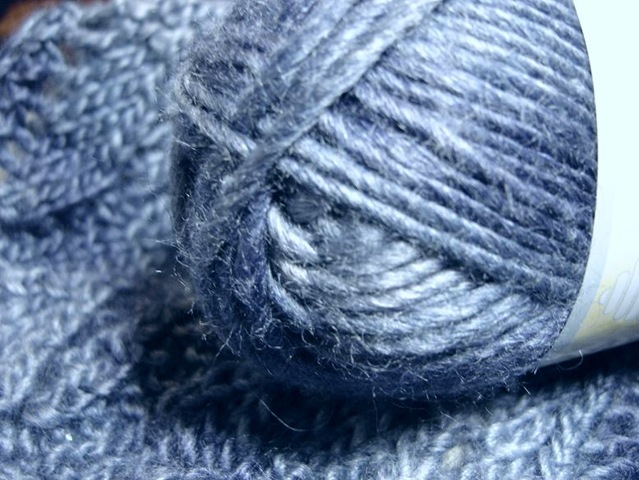 I had gone into a yarn store looking for something a) in a blue/grey/black, b) something worsted weight-ish, c) something that was made of natural fiber and warm. The original 198 yds. 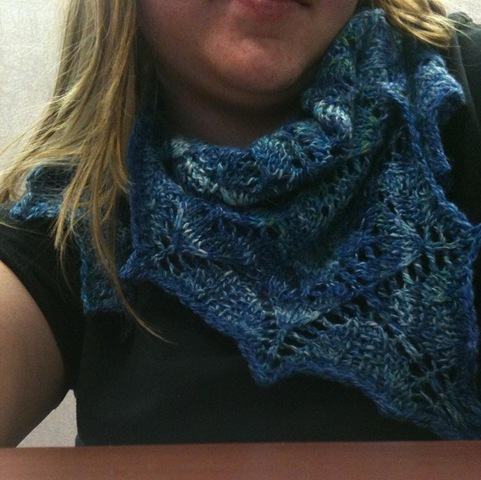 of Heaven pattern used a worsted weight wool, so I thought I would take my chances on this. I used the entirety of 4 balls... there are 5-6 very short pieces left and that is it. I even ended up splicing a few pieces to complete the cast off. It was close... I thought I would have to rip back a row and cast off again it was *so* close. 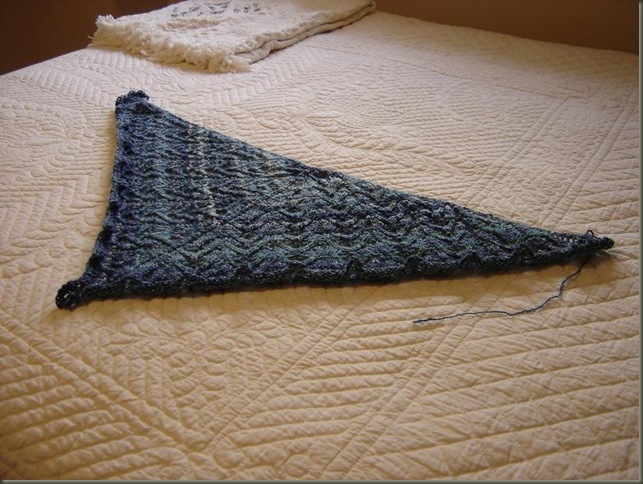 Before blocking, I wasn't sure if the shawl would be large enough. 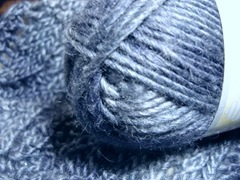 The Recipient wanted it to be large, wooly and thick. 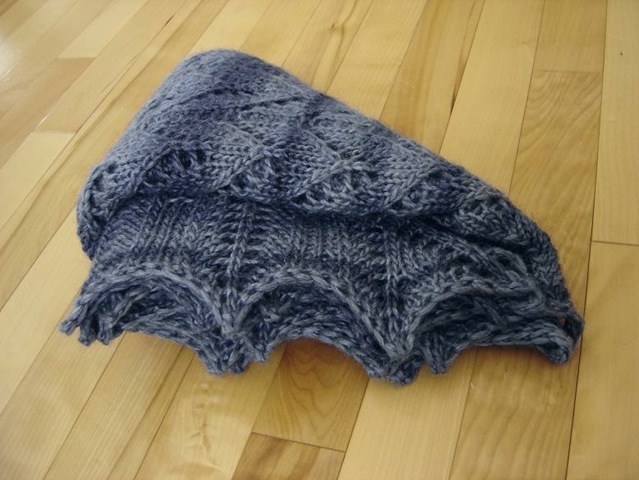 When it came off the needles, it measured 56 x 24 inches, but after a soak, stretch and rest the finished shawl blocked to 66 x 36 inches. Perfect size! 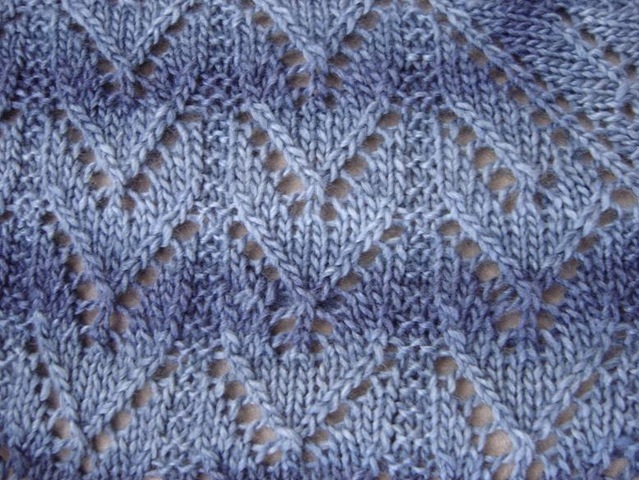 The final texture was a nice mix of thick warm stockinette panels and lacy open YOs. 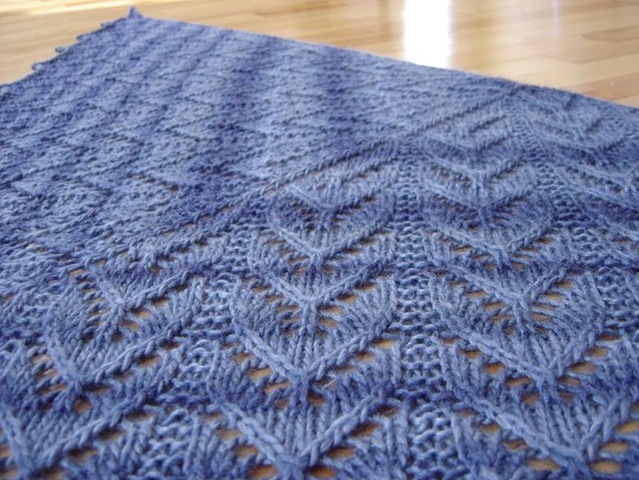 The Arrowhead pattern really stands out pleasingly from the garter stitch bars and ladders of Yarn-Overs. 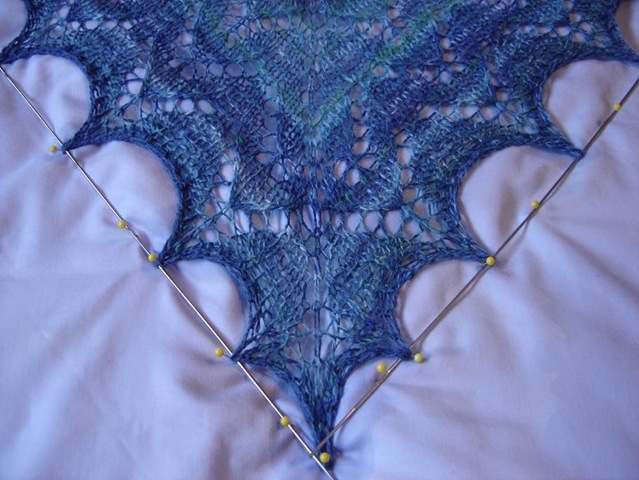 This lace pattern would be a good one for anyone who wants to get more comfortable with lace stitches, because it uses a good mix of stitches but does so in a predictable and easy to follow pattern of those stitches. It is easy to see what the next "move" is and where the patter is going. When I started out on this pattern I had test-driven a couple needle sizes to see the possible fabric textures... 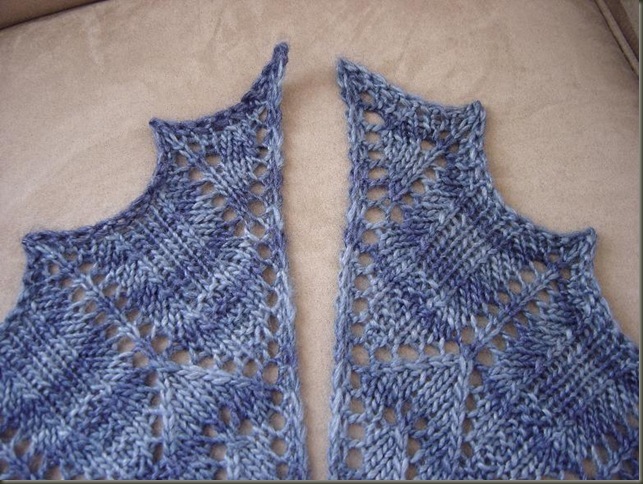 I settled on the 6mm circulars for the perfect mix of solid/lace. 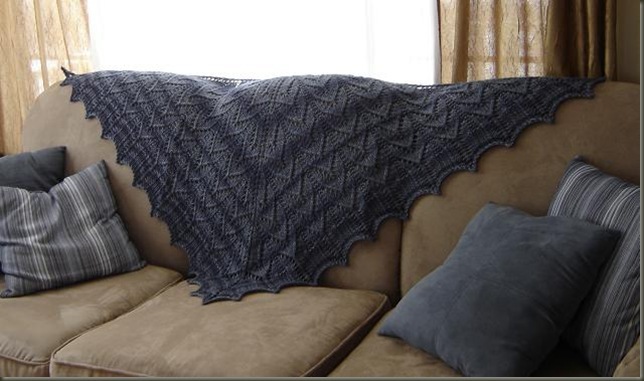 Here is a photo to give you an idea of the finished size... it stretches most of the way across my sofa! aaaaand it matches my living room decor!? how weird is that? More gratuitous post blocking photos! There are the lovely points again! 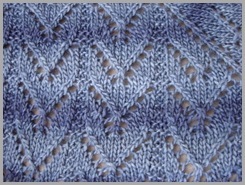 For the first stitch of each row I slipped a stitch "purlwise" with yarn in back and then continued on. 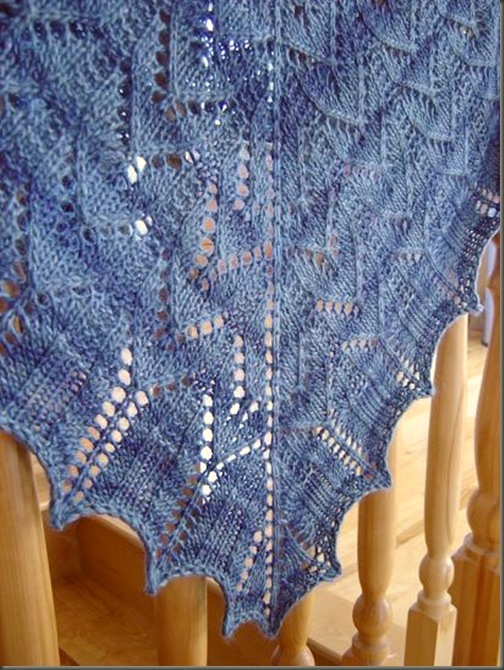 I learned this technique on another shawl, and have translated it into many other projects. 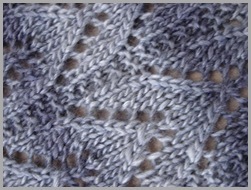 The resulting edge has a nice "finished" look... almost braided. 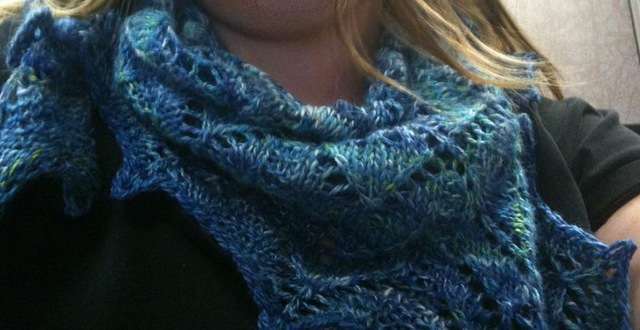 Here is a sneak peek of a shawl I've been working on the last week or so... getting ready to finish it up soon! 1. 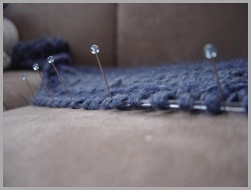 Testing out my progress... shawl pinned to faux suede couch cushion. 2. 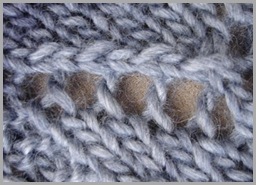 Sample of the lace pattern close up... showing denim color fading to pewter grey. 3. 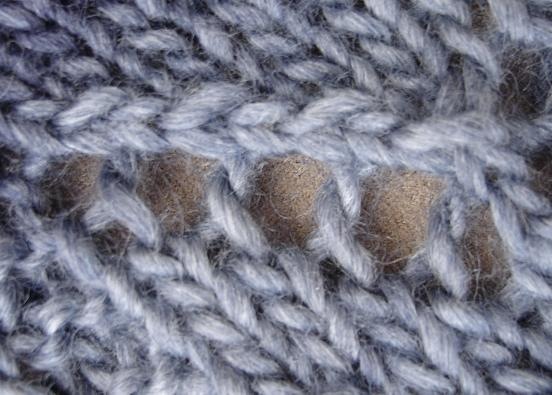 "eyelets" formed by the rows of YO's... I especially like the twisty laddders. 4. Another view of the lace panel and the graduated colors as they stripe in the finished product. 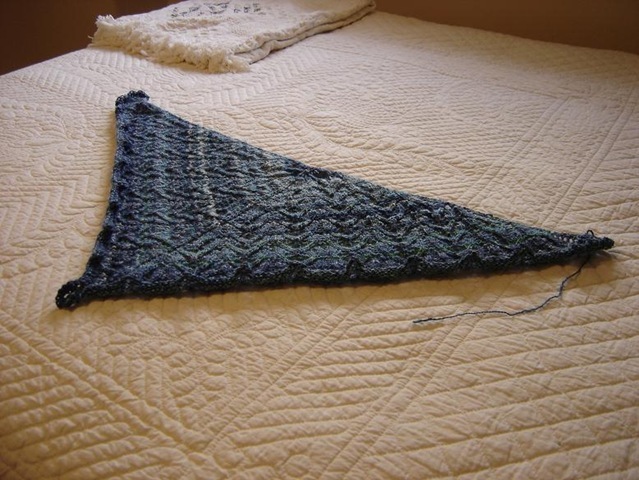 It sure didn't take long once I had started to finish up this quick knit shawl... 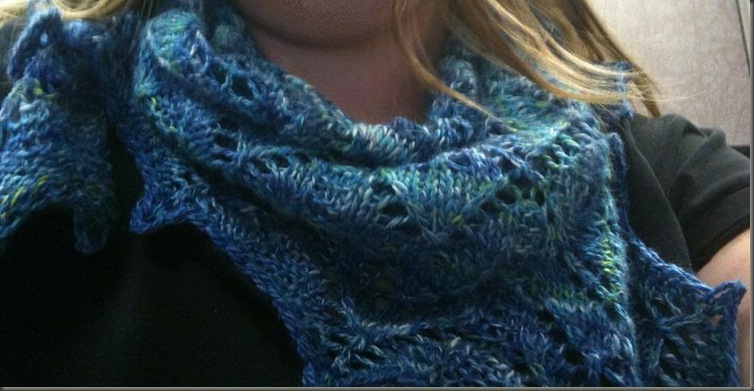 I like to refer to it as my "Survival Knitting"
Knitting gifts is fun in it's own way. 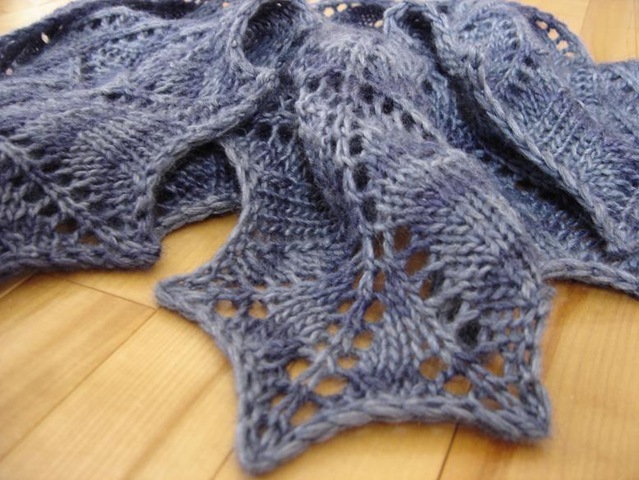 I really enjoy choosing special patterns, and then hunting for the perfect yarns and trying to create gifts that the recipients will adore and find very useful... but the knitting itself can be a lot of work. 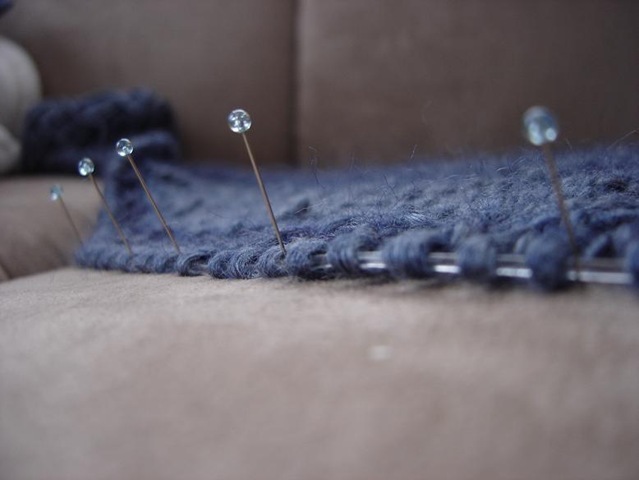 I am a pretty fickle knitter, and generally flit from one project to the next, finishing and starting things with gusto, but not in any particular order. So for me, finishing projects on a schedule can be a bit of a chore. This year in particular, I let my holiday gift knitting get a little behind calendar-wise, so I had to really push myself coming on the end. This shawl, on the otherhand, was a purely selfish and fun knit. I wasn't sure what I would do with it when it was completed... I wasn't even sure if I had enough yarn to finish the shawl in the first place! Working on it was frivolous and fun, which is exactly what a knitter needs after a few months of forced creativity :) I had a hard time this year getting into the holiday spirit and was really dreading the shopping, wrapping and decorating. 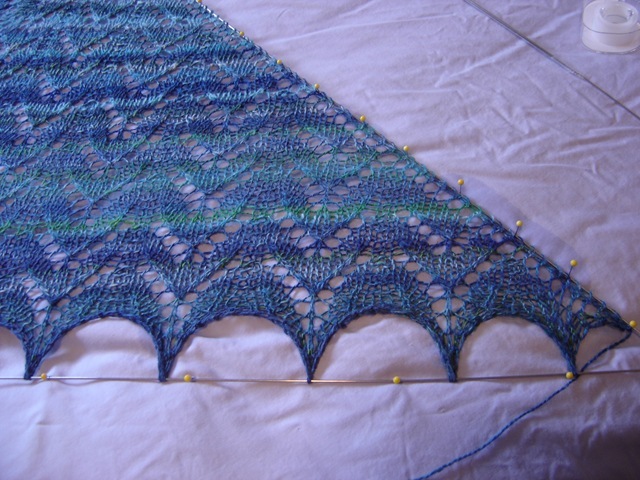 The stolen moments working on this shawl were really a godsend, and helped me keep my cool when I was feeling overwhelmed by the tasks at hand. 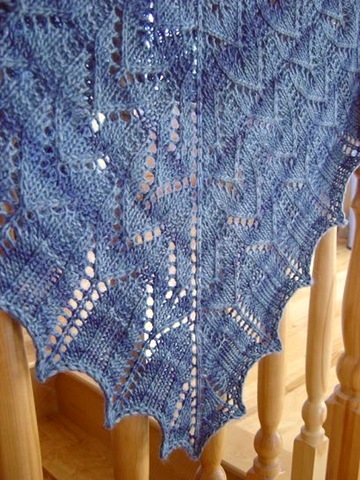 And then, when all of the chores were finished and the fun part of the holiday finally began, working on the shawl helped me to pass the time waiting to go out visiting and passing out gifts, and then it came with me for numerous turkey dinners and snuggled with me on the couch well into the evening on Christmas Day. I'm rather in love with it, I must say! As you can see in the picture (as the shawl is pinned out on a queen sized bed...) the growing process was satisfactory and the finished wingspan is more like 48 inches... which wraps nicely around my shoulders. The silk blend is very smooth, perfect for an item that might be worn draped around shoulders or around my neck. I am very pleased with the blended greens and blues and the way they flow into each other. 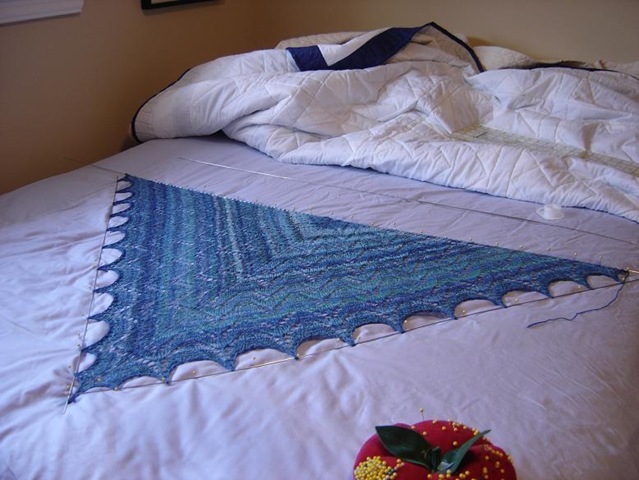 The shawl was finally dry on Christmas Morning, and I wove in the ends just in time to wear it out on Christmas day for the festivities. Lately it seems I get a chill quite easily, so I wore it all day either over the shoulders or tousled around my neck. I'm not sure how fashionable this stuff is considered now, but it is certainly comfortable and utilitarian.